This tweet, from one of the founders of 37 Signals and Basecamp, is in reference to their new book, It Doesn't Have to be Crazy at Work. Those sales numbers are obscene, even for a book whose built in audience is probably slightly more likely to buy from Amazon than the average joe. That is not indicative of a healthy market. I'm not suggesting any sort of regulatory remedy here. They earned that level of dominance, maybe not fairly, but since when is business in the US fair? However, the market is not working here, or maybe it's working too well. I'm not sure. 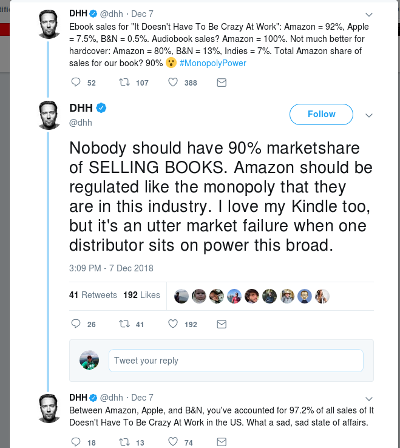 But every business needs real competition, so as you consider book purchases in the future, maybe you should consider buying from somewhere other than Amazon? Like maybe your local bookseller if one is still in business, or even Barnes & Noble if you still have one in the neighborhood. Online, try Powell's, a large independent bookstore in Portland that will ship anywhere, or again check the website of your local indie bookshop. They can probably drop ship direct from the distributor. E-books I don't have a good answer for. If you have a Kindle you are kind of stuck in that ecosystem. Kobo books can allegedly be converted with Calibre, but I haven't a chance to buy a cheap ebook there at test that. I will do that soon and report back. This is entry #13 in my attempt at 31 days of blogging for December 2018. I've haven't posted here daily since about 2007, so this should be interesting.